I’m a believer in taking action. Too many people stand around and complain and point fingers. If we all did more and talked less, I think the world would be a better place. Recently, both Google and Facebook have come under fire for fake news – Facebook for spreading it and Google for ranking it. 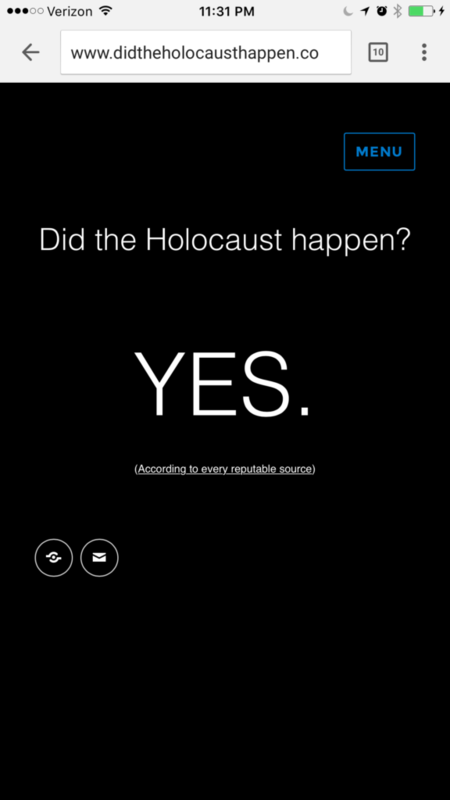 Right now, if you search [did the Holocaust happen] in Google, ranked #1 is a white supremacist forum that denies that the Holocaust ever happened. Google initially kept quiet but they now say that they are looking into ways to solve the problem at scale. That’a great and I agree needs to happen. But what good are we if we just sit around and don’t do anything to stand up against things that are happening that we disagree with? Our country was built on the backs of people standing up for causes that they believe in, using their skills to try to make the world a better place. It’s a simple site right now to get the point across. If you’re interested and have links to give, I would love your help getting it ranking. I’m doing outreach to journalists as well, but if you have connections I’d love to be put in contact. Email me john@johnfdoherty.com.